For all the credit fanboys give it for being “dark” (it got a PG-13! And KIDS get killed!… off-screen, kinda. Ooooooh so edgy!) Revenge of the Sith is, to me, where the prequels went from troubling & highly flawed to outright unwatchable. The storytelling gets even more muddled, characterization implodes, dialogue reaches a new low, the entire franchise’s biggest moments are fumbled, and the action is mostly half-hearted & disappointing. Anakin Skywalker, played by Hayden Christensen. Obi-Wan Kenobi, played by a visibly-bored Ewan McGregor. Count Dooku aka Darth Tyranus, played by Christopher Lee. There’s an air of… perfunctory-ness to the whole thing. Skywalker and Kenobi walk in and greet Palpatine, who simply responds with a flat “Dooku” indicating that he’s entered the room behind them (they’re Jedi, shouldn’t they have sensed him?). For his part, Dooku opts not to walk down the stairs near the entrance of the room but instead jumps & CGI-flips down off the railing. It’s very awkward to watch this 80+ year-old man “do” that, and doesn’t really fit with his more stately character– this guy isn’t Darth Maul, he shouldn’t act like it. The fight that follows is smooth & graceful, and it tries to make the most of its rather bland setting by having the combatants move around a lot through the two stories… but it’s missing anything to make it truly impressive. Some of the choreography doesn’t work either, like when Dooku delivers a kick that sends Anakin flying– Lee (or his stunt double) sells the blow terribly. It all adds to the sort airy weightlessness of the battle; it’s like watching cartoons fight. Dooku Force-punches Obi-Wan twice, the second time being a full-fledged body seizure that takes him out of commission for the remainder of the fight. This movie also muddies the water much farther into how Jedi’s telekinetic punches work: you wonder if there’s no way to defend against it, why don’t they do it more often, etc. The music kicks in when Anakin is left alone with the Sith Lord, and in a brief but furious fight he manages to literally disarm Dooku with one swift move, chopping off his hands and plucking his fallen lightsaber out of the air. He holds Tyranus in a scissor-lock and agonizes over killing him. After some goading by Palpatine, he eventually does. Lee does some nice work here when he reacts to the Chancellor’s command: it’s ambiguous enough that Anakin could reasonably interpret it as “oh no, I’m panicking because I’m about to die,” when in reality it’s “my master is betraying me, WTF!” But that only raises the question of why he doesn’t speak up and at least try to drag Palpatine down with him by revealing his role in all this– there’s nearly 20 seconds between when Sidious first gives the order and when Anakin finally gives in, plenty of time for him to get over his shock and start squealing like a stool pigeon. Hell hath no fury like a Sith scorned, one would think. At its best, the fight is gorgeous yet empty, and its worst it’s awkward. If this were merely the warm-up for better things to come, it wouldn’t be so bad, but unfortunately that’s not the case. Obi-Wan Kenobi, played by Ewan McGregor. General Grievous, played by CGI and voiced by Matthew Wood. Just a waste. General Grievous had been built up in supplementary material to be this super-awesome dueling master– a killer cyborg designed expressly to be the ultimate lightsaber fighting machine!– but in this fight the actual “dueling” part is over within less than a minute, and isn’t too interesting watch, besides. (“This food is terrible!” “I know. And such small portions!”) Not since the Matrix Reloaded’s Twins has such a great fight scene opportunity been bungled. All Grievous’ amazing skill comes off more like just a cheap trick. Despite pulling some crazy four-armed lightsaber-wrangling (two used for fencing while two more spins like fans above), Kenobi defuses the threat very quickly, and not in a way that builds the hero up so much as it brings the villain down. Grievous looks more here (and in his previous scenes in the film) like a poser rather than a genuine threat– he’s cowardly, ineffective and just plain weird. He’s not a Vader, a Maul, or a Dooku. He’s just kind of a clown. Kenobi himself doesn’t fare all that much better: Lucas fumblingly tries to give the character a Too Cool For School attitude as he non-chalantly drops into Grievous’ meeting with no apparent backup, and McGregor seems uninterested in trying to compensate for the poor writing. His big comeback (to being told he won’t leave alive) is a rather generic and half-hearted “Oh, I don’t think so!” Frankly even Fred Willard sounded more intimidating saying it. The “combat-ready” stance Kenobi assumes twice early in the confrontation (and several times throughout the film), where he holds his blade in one hand above his head, coils his body back, and points his other hand forward is really silly-looking. Anyway, after the arrival of clone trooper reinforcements and a really lame-looking Force punch (even worse than Dooku’s kick) that sends Grievous into the ceiling, the villain opts to scamper away on this weird giant wheel of a vehicle, with Kenobi in pursuit on this cool giant lizard that can somehow keep up. There’s a chase in which Kenobi drops his lightsaber (odd, considering how much he chewed out Anakin for doing the same thing in Episode II… also during a vehicle chase, coincidentally. But it’s understandable– it’s not like he has some kind of telekinetic power with which he could have retrieved it), then a crash that leaves the two on the edge of a precipice and both lightsaber-less. Kenobi does kind of well at first with a droid’s electric staff thing, but Grievous’ droid strength gets the better of him. Disarmed, the Jedi’s physical blows are no good (why doesn’t he Force-punch him again? Especially with that pit right there? ), but he does pry open the villain’s chest plate, leaving it exposed for several blaster shots right to the heart. 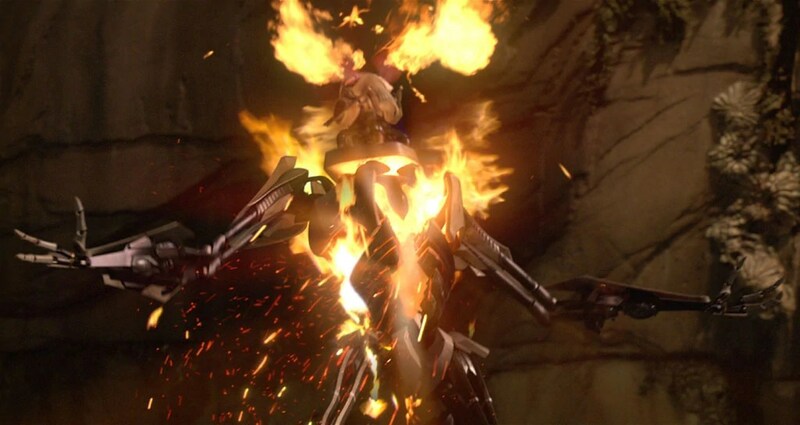 Grievous goes up in flames kind of awesomely. Of course, since back in Episode IV Kenobi compared the lightsaber as being a more “civilized” weapon than a blaster, here he discards the blaster in disgust by saying “how uncivilized!” Which is just a notch or two beneath “why do I feel like you’re going to be the death of me” in the Herp Derp Remember That Scene In The Old Movies?! category. I appreciate the scene’s ambition in trying for a new kind of battle here, especially considering it’s a lightsaber-heavy enough film as it is. The idea of Obi-Wan beating the bad guy with a blaster is a pretty ballsy and unexpected one, to be honest I’d appreciate it even more if I thought the movie had wit enough to be trying something “subversive” here, but of course it isn’t. It’s a short & lackluster lightsaber battle followed by an uninteresting chase and a quasi-interesting physical scuffle. And all against a weaksauce bad guy. Mace Windu, played by Samuel L (mothereffing, etc) Jackson. Chancellor Palpatine aka Darth Sidious, played by Ian McDiarmid. Three other Jedi Council members, whose contributions in the fight don’t even rise to “minimal”: Kit Fisto, Agen Kolar, and Saesee Tiin (I had to look up the names of the two who don’t have awesome green dreadlocks), played by Ben Cooke, Tux Akindoyeni, and Kenji Oates, respectively. This is so much less cool than you’d think. If the previous fight scene was merely disappointing and underwhelming, this one is just plain bad and stupid. The choreography is weak and uninspired, the characters less resembling two cosmic-powered titans having an epic showdown than two, ahem, “men of a certain age” awkwardly swinging swords at each other– even more so than Episode IV’s Kenobi/Vader showdown, but that was simply uninteresting; this is outright embarrassing. And yet, while it manifestly fails to deliver on its epic status, it’s also paradoxically too long. And did I mention stupid? The fight opens with Mace Windu and three other senior Jedi Masters approaching to apprehend Palpatine and, after some very mediocre dialogue, they engage in battle. Sidious opens up with this bizarrely unnecessary corkscrewing jump while he screech-howls like an animal. He then manages to kill Agen Kolar and Saesee Tiin, two of the most powerful and experienced Jedi Masters in the universe, with his opening strikes– in fact, the former falls prey to one of the most telegraphed lunges of all time. Lucas and co have a very hard time selling the awesomeness of one fighter without making his opponents look like total losers. Kit Fisto takes one to the gut a few seconds later, so then it’s just Windu and Palpatine alone. They do not acquit themselves well. Samuel L Jackson is a man of many talents, but sword-fighting on-screen is not one of them, and probably wasn’t even before he filmed this scene at the age of 53. And Ian McDiarmid… oof. He’s not a bad actor, as he’s spent a lifetime making quite a name for himself on stage, including in many Shakespeare productions. And his previous work as the unctuous & charming Senator Palpatine was actually very good, as was his work in Return of the Jedi. But his performance as Darth Sidious is absolutely, 100%, irredeemably awful. He’s a cartoon character in all the worst ways: he contorts his mouth like a buffoon, he cackles incessantly, and hisses like a snake when he’s angry. The overlord who spent decades methodically masterminding his gradual rise to absolute power has the same mannerisms as a schizophrenic hobo. McDiarmid’s performance (which I have to believe was molded by Lucas) is worse than five Jar Jars, because at least you were never supposed to take him seriously. Anyway, Mace Windu and Captain Clownface twirl around awkwardly throughout Palpatine’s spacious high-rise apartment. One of the fight’s few and fleeting moments of gracefulness is when it moves close to the enormous bay window and an errant saber swing shatters the glass. That’s kinda nice. Windu disarms Palpatine and he goes scampering about (again, like a cartoon), seemingly helpless. The duel ends with Windu’s blade in the villain’s face, which is of course just when Anakin The Dumbass enters. There’s some argument about whether Windu should execute Sidious on the spot, while Anakin wants him to live because he’s promised to help save Padme from dying. Palpatine can’t decide whether to play the helpless victim or whether to act overtly evil and, in what’s probably McDiarmid’s lowest point, he croons out “No, noooooo, noooooooooooooo!” and tries to zap Windu point-blank with Force lightning, which the Master just reflects back on him with his lightsaber. The lightning zaps throughout Palpatine’s body and either scars him permanently or reveals his true appearance, depending on what you believe (certainly Force lightning hasn’t marred the face of anyone else who’s ever been hit with it before this). Either way, he now looks more like he did back in Episode VI, though in a way that’s a lot more difficult to take seriously. The real kick in the gut happens here, after the fighting’s done. Although it would take just a few more inches of effort for Windu to shove his blade through Palpatine’s face, he instead rears back his arm dramatically so that Anakin has plenty of time to draw his own weapon and cut off Mace’s saber hand. With Windu defenseless, Sidious surges back to life and releases another torrent of Force lightning, graphically electrocuting him and sending him flying out the window. Prior to Episode III, Jackson was fond of declaring that he was happy to be in the prequels as long as he didn’t “go out like a punk.” Looks like he didn’t get his wish. But the worst part is how this one action undoes all of the franchise’s thematic resonance and years of emotional build-up. Anakin Skywalker didn’t turn to the dark side out of pride and anger, nor did he do so as a completely selfish and calculated decision. He did it in a now-or-never moment of pressure, for a noble reason: saving his wife. He isn’t evil, just paranoid and misguided. Luke’s personal victory in ROTJ no longer has the same power; he didn’t win the battle his father lost, because his father turned “evil” under completely different circumstances. Anakin gave in to love, not aggression. Arguably there’s some poetic symmetry to the reveal that Anakin joined the dark side to save someone he loved and left it for the same reason, but it also makes his final decision a no-brainer: of course he’ll save Luke at the end, because saving family has always been his motivation. So. This fight is completely un-exciting, frequently clumsy, and the ending undoes a huge part of what makes Star Wars tick. I’ll be generous. And let’s take a moment, if we may, to spotlight the absolutely horrible makeup job on Darth Sidious. The idea here is to make him look like the wrinkled, sagging freakshow audiences were introduced to in 1983 and indeed it follows the same general template, but too many things are just… off. Even without McDiarmid’s much more spastic performance and choreography that contorts him in very un-flattering ways, the overall effect of the new Palpatine is not comical but creepy. This is the ultimate dictator of the galaxy and the evil mastermind behind six epic films. I shouldn’t wince every time he’s on screen. Yoda, by Frank Oz and CGI he is played. Emperor Palpatine aka Darth Sidious, played by Ian McDiarmid. Is it possible to create a really good sword fight featuring a 60-year-old robe-wearing & makeup-slathered actor against a diminutive CGI muppet? Maybe, but ROTS doesn’t provide a lot of evidence in favor. This time around there’s actually some gravitas at play, thanks largely to audience anticipation, Frank Oz’s performance, and John Williams’ music. Yoda’s entrance into Palpatine’s chambers is pretty cool– he casually flicks a hand and it drops the two door guards to the ground. He is, however, weirdly unprepared for the jolt of Force lightning that knocks him into the wall, even though (again!) Sidious telegraphed the fact that he was about to do it pretty heavily. It looks like Qui-Gon Jinn’s “he can see things before they happen, that is why he appears to have such quick reflexes. It’s a Jedi trait,” in TPM is just below Kenobi’s “only Imperial Stormtroopers are so precise” in terms of Statements Not Supported By Reality. Yoda dusts himself off and retaliates with a strong Force punch* that sends Palpatine across the room. Switching emotional polarities really quickly as usual, Sidious panics and tries to escape with a cartoony flip that really doesn’t match his look (and his naked cowardice doesn’t inspire much admiration for him as a villain), but he’s cut off by Yoda, who utters a smug, “If so powerful you are, why leave?” Sidious’ retort is weird: “You will not stop me. Darth Vader will become more powerful than either of us!” The way McDiarmid delivers it, it sounds like the second sentence is being offered as a justification for the first, even though that makes no sense. At this point, viewers had certainly become accustomed to George Lucas writing dialogue exchanges where each character’s lines didn’t seem to have anything to do with the other’s, but it’s rare that a single character can’t even follow his OWN lines. 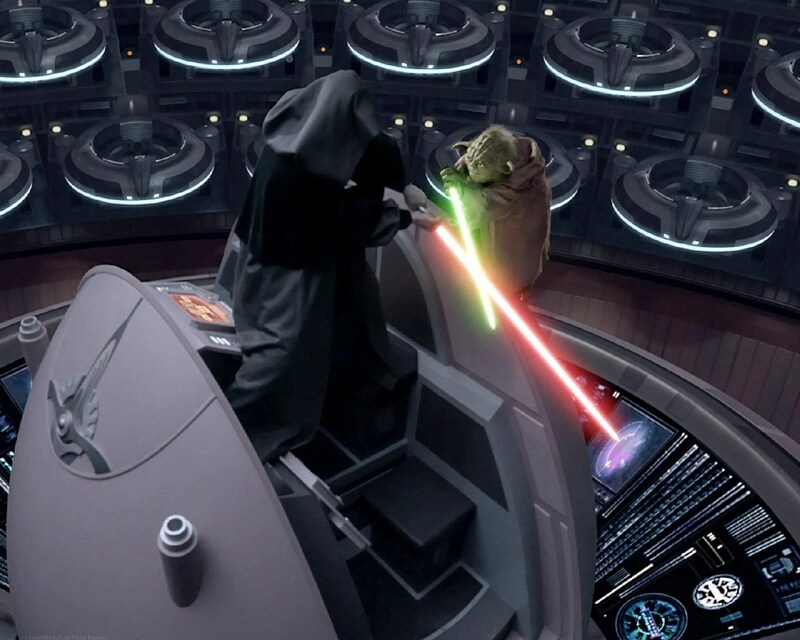 Anyway, after some really awkward posing by Sidious and a cut away to the Anakin/Obi-Wan fight, the two find themselves dueling on the platform that rises into the middle of the empty Senate chambers. It’s here that the combat is actually the most interesting. Yoda is flipping about still, but with much more actual sword work than in his clash with Count Dooku. The new music trailing in from the other fight & some smart camera work really convey the epic scale of the conflict, and of course the symbolism of this deciding battle occurring in the very heart of the Republic’s political system is powerful if obvious. The fight gets a lot less compelling after the next cut, when we find the two have somehow separated: Sidious is several stories above Yoda in the enormous chamber, ripping out empty Senate seats (again: symbolism!) with the Force and throwing them at his tiny foe (“Duel of the Fates” plays from this point on, but it doesn’t gain much in being repeated from Episode I). The acrobatic muppet has little trouble dodging them as they come, and he finally gets Sidious on the defensive by seizing one & returning it to sender. As he does with every other emotion, McDiarmid WAY oversells his panic at having to dodge a single projectile. 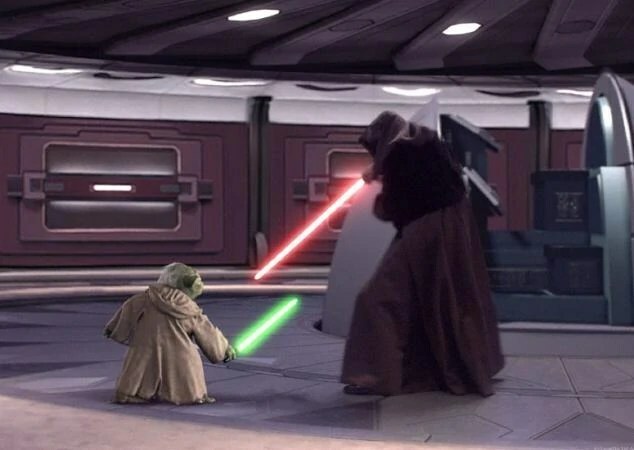 As soon as he re-orients himself Palpatine is face-to-face against Yoda, but he knocks the saber out of the green alien’s hand with a quick burst of Force lightning. It now becomes pure strength against strength, as Sidious pours on the juice and Yoda tries to push it back. Yoda seems to get the upper hand and when he repels the attack it creates an explosive pulse that sends them both flying. Sidious is able to get hold of a guard rail but Yoda is not so lucky, so he falls a loooong way down and takes a couple hard thumps on the way. More baffling is the pervasive laughter on the part of Darth Sidious throughout the fight. Not just laughter but straight-up cackling, with all the professionalism of a tenth-grade drama student playing a witch in Macbeth. He cackles after he’s zapped Yoda with lightning at the beginning, he cackles several times when they’re locking swords, he cackles as he’s heaving Senate pods at Yoda, he cackles while Yoda is seizing the Senate pod and spinning it in place in preparation to send it back, he cackles while Yoda is falling. He cackles without any regard to whether it’s an appropriate time to do so or whether it will impress the audience. Yes, way back in ROTJ the Emperor’s creepy laughter was a continuous presence in his climactic scene, but there it made sense: Palpatine had Luke right where he wanted him, he was steadily working to unnerve & aggravate the man, and he had every reason to believe his ultimate victory was achieved. Here he just cackles compulsively and ceaselessly. Like most everything about McDiarmid as the Sith Lord, it’s meant to be grand & scary but it comes off as petty & comical. When it comes to over the top acting, there’s a fine line between hammy and vampy. This is so far on the wrong side of that line it makes the 60s Batman villains look like Mark Ruffalo. There’s more to like here than in most of ROTS’ other fights, but it’s weighed down by too many clumsy missteps and unforgivable errors. Wasted potential. Darth Vader formerly Anakin Skywalker, played by Hayden Christensen. After some truly terrible opening dialogue (“only a Sith deals in absolutes!” Hmm, ONLY a Sith, huh? Sounds like an absolute statement there, buddy), the duel kicks off more spirited than anything since the Episode I. For those first few minutes, everything comes together perfectly. The actors, via either their own skill or just through sheer repetition, move at an incredible pace through an exquisite dance of death, never missing a single beat. Christensen in particular– with his tall & lean physique, striking black outfit and don’t-give-a-crap long hair– cuts the most imposing profile in the trilogy since Liam Neeson took a dive. Lucas shoots the whole thing like a pro, alternating skillfully between close-ups, mediums, wide shots, overhead angles, and even one striking behind-the-back view as the pair duel through a narrow hallway. Remarkably, even though the opponents are using the same color lightsaber (a first in Star Wars history!) and seemingly move in fast-forward, you can actually keep track of the action and see what’s going on. And John Williams’ specially composed piece “Battle of the Heroes” plays up immediately and keeps going for quite a while– it’s exciting, memorable, and hauntingly tragic. This is the only fight in the whole movie that’s firing on all cylinders. There are some interesting beats in the control room, including some more intimate physical work like a disarmed Vader choking Anakin with his robot hand and doing the “why are you hitting yourself?” thing as he tries to turn Kenobi’s own saber against him. 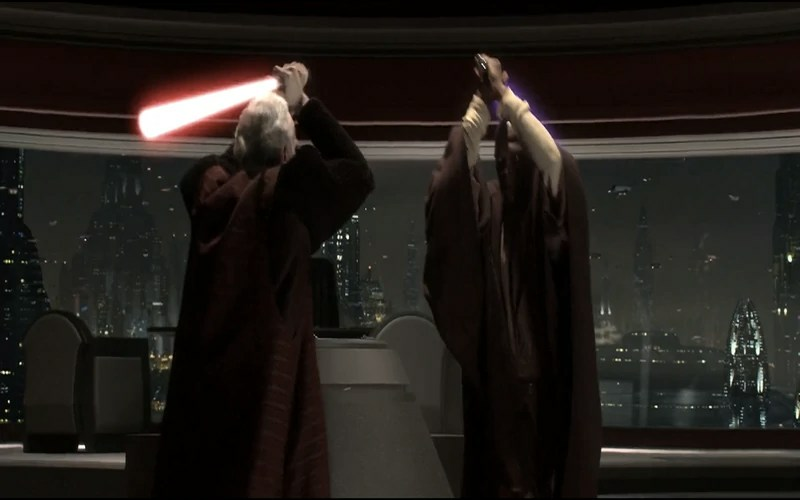 In another cool beat, the two conclude a dazzling series of point-blank blows by trying to simultaneously Force-punch each other, which turns into an impromptu telekinetic wrestle that results in both flying back– odd, because while it’s believable that in a straight duel Obi-Wan’s experience and intimate knowledge of Anakin’s technique might put him on even footing, in a contest of raw strength the Chosen One would surely have the advantage. Anyway, unfortunately, it’s not long after that an errant strike from Vader manages to hit the “press here to destroy whole chunks of the installation” button on a control panel. And naturally the two Jedi, with their finely-honed instincts and powers of precognition, think that’s the perfect time to venture out from the relative safety of the control room out onto more precarious and crumbling parts of the facility, where they’ll be exposed to the continuous splashing of liquid hot magma. Right. What follows after could not possibly be more boring. The combatants still take occasional swings at each other but they’re mainly preoccupied with jumping around as pieces of the facility fall down and dodging lava. It’s meant to be spectacular but it’s all just so much green screen sound & fury, signifying nothing. It completely interrupts the flow of the fight and makes this all-important confrontation wind down rather than build up. Once the erstwhile master & apprentice find a some real estate in the lava river (a floating droid and a chunk of metal with its force field still working, that is. Even still, shouldn’t the proximity to that much heat be enough to kill even a Jedi?) the two have a few more up-close clashes, but nothing near the furious beauty of the fight’s opening. They also talk a little more, and Ewan McGregor gets in his only affecting bit of performance in the entire sequence, if not the whole film: as he tells Anakin that he’s sorry how he failed him, he has the look & sound of a man who’s lost so much he can only laugh grimly at his awful situation. He’s actually smiling as he says it, in a crazy sort of way. Unfortunately it is soon overshadowed by what’s the worst line that George Lucas ever wrote, indeed one of the worst lines in the history of cinema: when Kenobi declares that Palpatine is evil (hey Obi-Wan, is he ABSOLUTELY evil? ), Vader replies, “from my point of view, the Jedi are evil!” Which… gah. That’s not something anyone would say in that situation, in fact it’s not even actual dialogue– it’s an actor reading his script notes out loud (“ANAKIN: 22 years old. Tall. Headstrong. Driven by love to paranoia. From his point of view, the Jedi are evil. Hates sand”). And the movie still can’t decide if Anakin has only joined the dark side on a selfless mission to help Padme, or if he’s genuinely swallowed Palpatine’s silly story about the Sith being misunderstood good guys out to bring order to the galaxy. Neither, of course, matches the Darth Vader we were introduced to in 1977, but of course that’s been off the menu for a while now. Shortly after this, Obi-Wan spots some safe terrain atop a nearby small hill, and flips to safety. He announces that the fight is over because he has “the high ground” and warns Anakin not to come at him bro. Vader disregards and tries to flip all the way over Kenobi’s head and directly behind him, but Obi-Wan lunges in and with one quick strike he chops off the other three of Vader’s remaining original limbs, leaving him to tumble down towards the lava and eventually catch fire. There are so many ways in which this makes no sense. Search throughout the entire previous six movies for a Jedi duel where “the high ground” was a deciding factor in anyone’s victory. Your search will be in vain. 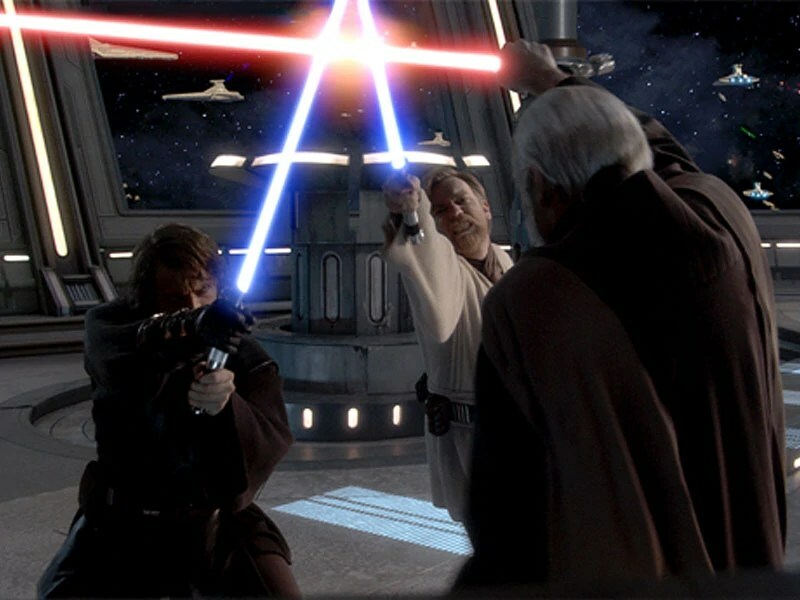 In point of fact, Obi-Wan Kenobi himself flipped directly over the head of a ruthless Sith Lord not once but twice back in Episode I, at the beginning of the fight and (even more so) at the end– yes, that’s right, the arrogantly foolish move reduces Anakin to a torso is the same move that Kenobi used to WIN a fight. In fact Anakin himself got away with flipping over Kenobi’s own head (to land on his platform) about a minute before this! Besides that, even if it was a stupid idea, there was plenty of room on that mound for Vader to land on that wouldn’t have put him within his opponent’s striking distance. With all the various listings of Lucas’ faults that populate the Internet, “he doesn’t know how to end a fight” gets a surprisingly small amount of play. So Obi-Wan chews out his old student one last time, takes his lightsaber and leaves him to die. Others have complained that it was foolish for Kenobi to just assume Vader died rather than finish him off, but given McGregor’s performance the more obvious (and compelling) interpretation is that he’s just too sad and disgusted to even look at Anakin anymore. And that, of course, is that. The emotional and aesthetic linchpin of the entire Star Wars series ends not with a bang but with an idiotic whimper. Well, that’s it for Star Wars, unless this blog hangs around until 2015 or so. I wish I could have gotten the more painful-to-review prequel fights out of the way first and followed up by commenting on the glory of the originals, but I suppose that’s sort of fitting. Coming Attractions: After all this star warring, we’ll unwind with some really, really, ridiculously silly. I won’t give away what it is, though I kind of just did. This entry was posted in Star Wars and tagged lightsabers, one-on-one, sci-fi, Star Wars. The high ground?!?! I remember sitting there stunned at the stupidity of that statement. It was worthy of Robot Chicken parody and I’m stunned they didn’t. Obviously Yoda had to surrender to Palpatine as he was higher up in the senate chamber. Remember it was Lucas who decided nuking the fridge was a good idea. It really does mystify me how many groanworthy things there are about ROTS that almost nobody points out, even as they continue to obsess over things like Jar Jar or kid-Anakin saying “yippee” two whole times. Heck, 30 years later and people are STILL complaining about Ewoks. I thought it might be that by the time Ep III rolled around fans had given up caring, but actually ROTS gets a surprising amount of grudging respect from Star Wars fans, despite being the most boneheaded entry of all. Kill a few children off-screen and all sins are forgiven, I guess. That’s what modern fanboy culture has come to. Plot wise we could rip these apart but we are here to argue fight scenes. True, by the time Episode 1 came about audiences wanted more than they got from Jedi. For Jedi on Jedi action I really think 1 was the high water mark. It lacked emotion but for action it was there, it was spectacular and it was not a complete mess of CGI wire fighting and nonsense. It wasn’t perfect but watching Ray Park school two Jedi without resorting to CGI gymnastics was far cooler than all the nonsense which followed. Lucas’s need to one up himself destroys his own creation. If Vader is going to rip parts of Bespin’s refinery to pieces and pelt Luke then Palpatine throws the entire senate around like frisbies. Maul is acrobatic so Christopher Lee has to fly through the air. It’s like taking a great bacon cheeseburger and continually adding toppings until you have an indelible mess. Think of Chris Farley in Tommy Boy describing making a sale and proceeding to destroy the customer’s desk and start a fire. That is Lucas! Start with a success (end fight from 1) and pile extra stuff on until you have the horrible fight scenes in 2 and 3. You are wrong about the Windu vs Sidious fight. It is not known who would have won if Anakin wouldn´t get in. Palpatine was not weakened at all, since he threw Windu out of the window with not much effort. And Lucas himself said, Palpatine was just pretending to be weak. I’m just offering conjecture based on the facts at hand and simple logic. Again, given Windu’s place in the Jedi order (second only to Yoda, who only loses to Sidious by a hair, and even that is on accident), Sidious really should not be SO much more powerful that he’s able to toy with him like that. It’s like saying the fastest sprinter in the world can afford to slack off if he’s racing against the second or third-fastest sprinters– no, he still has to work for it. I’m aware that Lucas has given his interpretation, and I laid out why I don’t think it makes sense. Besides Lucas has a history of being, shall we say, “flexible” with the truth when discussing Star Wars, so anything he says has to be taken with a grain of salt.